The Governor of Wisconsin will be proclaiming Thursday, May 23, 2019 the very first Wisconsin School Garden Day! Wisconsin School Garden Day honors and celebrates the educators, students, families, community leaders, and all people who have made garden-based education a reality and an asset in their schools and communities throughout the state. Wisconsin is a leader in garden-based education. This day brings recognition to the people and programs giving Wisconsin’s youth access to innovative, hands-on educational opportunities. 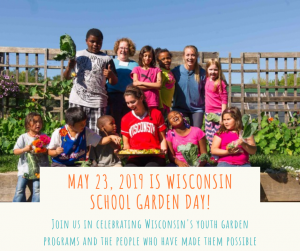 You can participate in Wisconsin School Garden Day by engaging in some type of garden-based education activity or celebration on May 23, 2019 (or another day that week) in solidarity with youth garden programs across the state. Whether your garden-based education program consists of a half acre of raised beds, some potted herbs, or seeds germinating on a countertop, you can participate in Wisconsin School Garden Day. Some programs may already have an activity in mind. That’s great! If you are looking for suggestions, we’ve compiled a Wisconsin School Garden Day activity guide. And if you’re looking for more guidance or inspiration, please reach out to Wisconsin School Garden Network Staff. We want to know what you have planned! If you know how you will celebrate Wisconsin School Garden Day, tell us about it! You can email Communications Director Renata Solan or share on Twitter or Facebook with the hashtag #WISchoolGardenDay.